The color is red,, no holes, or stains, very light piling. Soft, durable 200-weight Synchilla® fleece insulates even when wet. Snap chest pocket on yoke seam is also reinforced with Supplex. Polyester fleece (80% recycled). Fleece Weight. Features stretch binding on the cuffs and straight-cut hem. Thanks for supporting our small business! Shirt is flawless. Measurements: Size- XL Chest- 26.5” armpit to armpit Length- 32” collar to the bottom of the jacket Sleeve- 25.5” shoulder to cuff Shop with confidence as all of our clothing comes exactly as described. Polo Ralph Lauren Big And Tall Ski Rescue Jacket Size 4xlt. No rips, jacket has black marking around the collar(from wear) jacket has also been kept in good condition. P.S can be very flexible with the price! P.s please be ready too pay if your offer is accepted. Condition is Pre-owned. In pretty good shape. There is a stain on the back of the sleeve. Hardly noticeable. Tesla Red Full Zip Sweater Jacket Fleece XL. Condition is Pre-owned light wear. Shipped with USPS Priority Mail. Condition is Pre-owned. Classic red model. Pullover with 4-snap nylon placket and stand-up collar. Made of heavyweight polyester fleece. Hip length. Left-chest pocket has nylon flap and snap closure. Red with blue trim. 30" Length. Mens Columbia UGA Georgia Bulldogs Fleece Full Zip Jacket L Large University. Condition is preowned. Great condition. 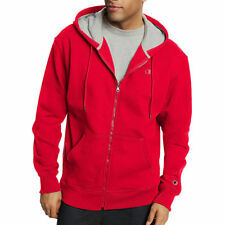 Red Under Armour Fleece Jacket Sz. Condition is Pre-owned. SIERRA PACIFIC Premium Men's Full-Zip Anti-Pill Fleece Vest 3010 S-6XL New!! CHAPS Maroon Fleece Half Zip Jacket Mens Warm Winter Wear Coat Size L. Condition is Pre-owned. Shipped with USPS Priority Mail. It is in great lightly used condition. Mens Nautica Fleece XXXL. Shipped with USPS Priority Mail. 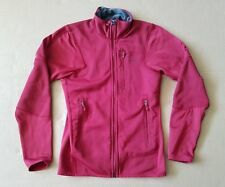 PATAGONIA BETTER SWEATER 1/4 Zip Pullover Fleece Jacket Size Mens XS Red. Condition is Pre-owned and in great condition. Slight pilling in some places but not noticeable. Shipped with USPS Priority Mail. Hooded Fleece Jacket. Has two chest pockets and two side hand pockets. Length is 34". Never worn! Insulated brooks brothers sport coat. Perfect for spring! 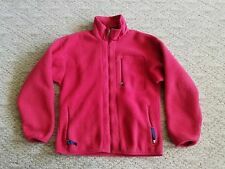 Mens red PATAGONIA R2 Regulator Fleece Jacket Large Size L. Pre owned mint condition, no tear stains or rips.